Obituary for Barbara (Di Geronimo) DuSablon Bobbie, daughter of James and Frances Di Geronimo, passed away in New Mexico after a long battle with ALS. Bobbie is survived by husband, Paul of New Mexico and dear friend, Libby Beck, also of New Mexico; siblings, Denise and Andrea of Akron and brother, Patrick of Vancouver, WA; family, Adam S. (Bridget) and their children, Gezzelle, Adalyn and Terrence, Adam Michael (Madeline) and their daughter, Isabella Grace, Megan (Joe), their daughters, Harper and Ella and Michelle, Anna and Ariel; and cousins in Ohio. 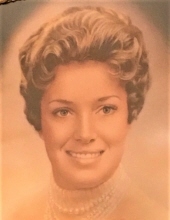 Bobbie graduated from St. Mary's High School in Akron and worked for Ohio Bell in Akron and California earning her Bachelor's Degree from the University of California. She earned her Master's Degree in Social Work from the University of Hawaii at Hilo, and worked in Hawaii for 15 years before retiring to New Mexico. Bobbie was a 38 year member of AA. Bobbie and Paul both participated in the New Mexico Senior Olympics for several years and both won several gold and silver medals for rifle shooting. Bobbie was the leader of Silver City T.O.P.S. Group. She was also a Certified Raptor rehabilitator and rescued many birds. She traveled the world studying birds. She will be greatly missed by Lexington and Easter. Bobbie was cremated and a memorial service will be held at a later date in Akron, Ohio. Donations may be made in Bobbie's name to the ALS Foundation. Please go to hbm-fh.com to offer condolences, share memories and order flowers.